Playdom Designer Urges Social Devs to Make "Unanticipated Golden Poo"
Game designer and former Escapist columnist Scott Jon Siegel challenged his fellow designers to "stop pretending social games are beneath you," saying that preconceived notions about social gaming are the biggest obstacle to making great social games. If we put together a list of common gamer preconceptions about social games, it probably wouldn't be very complimentary. Boring, shallow, primitive and invasion of privacy all leap to mind, and it's hard to deny that for every cool, original title released, there are 100 dull derivatives all clamoring for attention. But is that an inherent flaw in the genre, or simply a shortcoming in how it's approached? Siegel, now a designer with Playdom, is convinced its the latter. Speaking at the Montreal International Game Summit, he said developers, specifically in the indie community, need to "re-think their assumptions about social gaming." He used the example of Ian Bogost's Cow Clicker to demonstrate how interesting things can happen once you abandon conventional limitations and throw caution to the wind. Cow Clicker, for those unfamiliar with it, is "a Facebook game about Facebook games" in which players are given a cow they can click. Six hours later, they can click again; clicking earns clicks and players can use Cow Clicker currency called "mooney" to buy "premium" cows. You can share your cow clicking in your Facebook feed and click on friends' cows in theirs. It was intended to be a satirical look at the FarmVille style of gaming that's so popular on Facebook, but something unexpected happened: people liked it. "The ridiculous thing is, without even trying hard Ian actually made a moderately successful and compelling game," Siegel said. 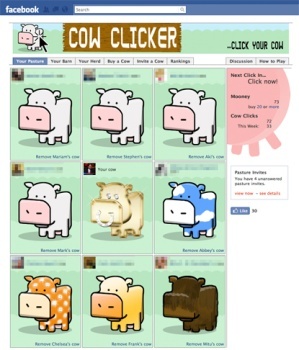 "At its height, Cow Clicker had 24,000 Monthly Active Users, though it's since dropped to around 13,000. But the remarkable thing is his DAU/MAU - a common metric for measuring player retention - has been going up." He related a story about a writing professor who encouraged his class to write bad fiction, a project which actually resulted in some "interesting things" because the writers were freed from the usual constraints and expectations of what good writing should be. He said the same lesson could be learned by game designers, pointing out that after making "incredibly earnest games for years," Bogost set out to make something terrible and ended up with tens of thousands of players within a month of a release that had absolutely no fanfare at all. "Unanticipated golden poo," he described it. The lesson? Cast off your chains of oppression! Or, possibly, just start giving the social game genre a little bit of respect. "Maybe the indie community has its ironic necktie on too tight," he said. "Maybe some of the most playful people in our industry are so busy feeling like they should feel opposed to games on social networks that they're not willing to try being playful."